Pepperdine’s Calabasas campus was an investment born out of necessity and designed into an innovative forward-thinking combination of academic and operational space. The renovation of Pepperdine’s Calabasas campus is a multi-phase endeavor sequenced to allow the building to serve as surge space for various other construction projects on campus before it ultimately is developed into its final state—a multi-purpose academic and operational university campus. 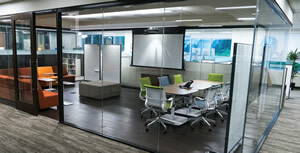 The first phase of the renovation, creating modern open architecture office space, made possible the move of approximately 100 staff members in four departments from the Malibu campus, and set in motion a gravitation toward working space reflecting our priority principles: community and collaboration. The project also embraced hoteling spaces and conference rooms with new and reliable technology to connect our campuses, and it implemented sustainable elements, significantly upgrading the building from its original 1998 structure. It is a contemporary representation of our traditional architectural touchstone coupled with an innovative embrace of new technologies and working styles. A number of large-scale construction projects began on the Malibu campus in the summer of 2016, particularly the Payson Library renovation project, which required all library collections and operations to vacate the library facility, but which also demanded interim library services during construction. The monetary cost and the impact to the campus community to accommodate these relocations on the Malibu campus were very high. Accordingly, we considered off-campus surge space options. Our search uncovered a unique opportunity with great potential—a building 13 minutes from the campus that not only accommodated our near-term library surge space needs, but which also gave us the space needed to pursue our aspirational goal of relocating operational departments from the Malibu campus to open up space for academic growth. After securing a long-term lease on the 107,000 square-foot building (a unique and desirable combination of warehouse and office space) and the necessary entitlements, the University moved a majority of the library books into the bottom floor space and instituted a highly effective request and delivery system with an established library hub in Malibu. We also created study space in the new building to supplement the interim study space options created on campus. This was all done without renovation in the existing spaces on the first floor. Phase one renovations aimed to accommodate evolving working styles and to foster community and collaboration, while also capitalizing on natural light from the many building windows with an open architecture layout. The project utilized low-profile workstation partitions and glass walls, including on individual offices, wherever possible. When privacy or security concerns dictated solid walls, we focused on thoughtful placement of these spaces in the building layout and the use of partial glass frosting and clerestories to allow light to permeate to the building center. 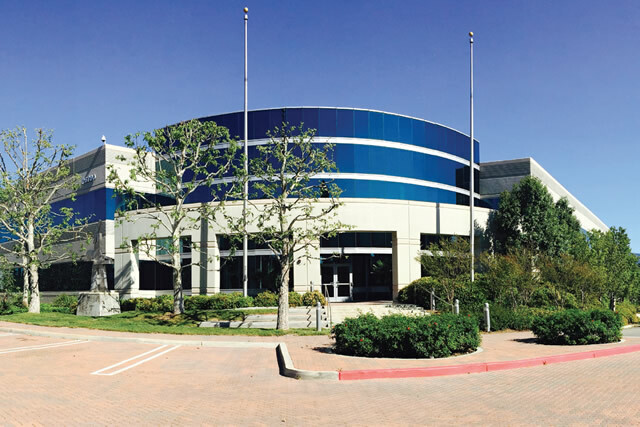 The Calabasas campus location is close to Malibu, and for many employees living in the San Fernando Valley, an interim stop to our main campus. 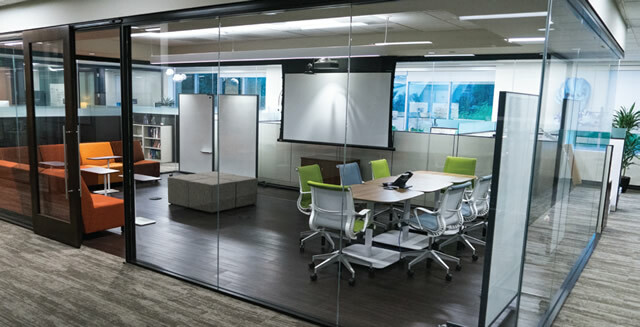 To cement the connection between the two campuses and encourage collaboration, and to reduce the traffic traveling between Calabasas and Malibu, we intentionally designed in ample hoteling offices and conference rooms in Calabasas. To establish seamless connectivity, we outfitted these spaces with reliable video conferencing and presentation technology, including Asus Chromebox for Business Solution, wireless microphones, HDMI connected projectors, wall-mounted Touchlink touch pad controls, conference phones, and telephonic mobility (whereby you can transfer your office phone line to the hoteling space from which you are working). 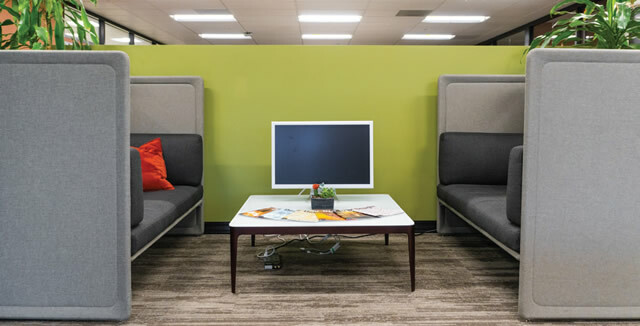 Our design and construction teams capitalized on extensive design input sessions with departments to provide furniture and designed areas conducive to the best work for the department, instead of one size fits all office space. For some this meant the inclusion of collaborative rooms and enhanced technology (integrated marketing and communications), and for others this involved accommodating privacy concerns and establishing meeting spaces for external consultants (finance). 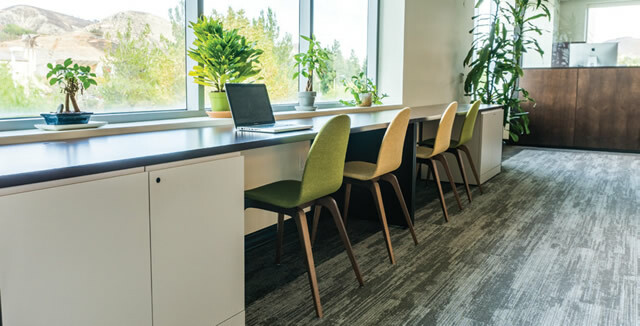 All workstations and offices received sit/stand desks, meeting employee requests and encouraging healthy lifestyles, and glass magnetic whiteboards were installed in hoteling offices, conference rooms, and private offices. As it does in all its domestic and international locations, the University prioritized security and safety at this campus and installed a sophisticated access control system on all interior and exterior doors. The system utilizes University ID and PIN code access and allows for accountability and tracking, programmable access schedules, and remote access by the administrator. System capabilities enable lockdown and unlocking in case of emergencies as well. Sustainability was a priority in the renovation, reflecting Pepperdine’s long-standing environmental commitment. Luxury vinyl tile, a more easily maintained hard surface which does not collect and hold allergens, covers a large portion of the second floor. 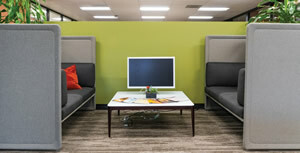 Where carpet was installed, the project incorporated carpet squares for ease of maintenance and sustainability. To promote conservation, the University installed ultra low flow fixtures in bathrooms, installed dishwashers in break rooms to promote reusable kitchenwares, and incorporated high-end filtration systems and water bottle filling stations to eliminate water delivery service. Break room countertops are quartz—eliminating the need for harsh chemicals and allowing NSF certification for food preparation. All lighting fixtures are dimmable and hold LED lights. The designers capitalized on daylight harvesting and the connection of all lighting fixtures and HVAC units to the University’s energy management system to further reduce and manage energy consumption. This was not an easily accomplished task. The leased building utilizes 50 individual package HVAC units to regulate inside temperatures and has a large number of South and West facing windows. This necessitated the creation of many smaller zones assigned to package units and accurate and appropriately developed energy management system logarithms to ensure occupant comfort while achieving energy efficiency. Finally, it is not often you can look to a building’s restrooms as a design destination, but that is certainly the case in Calabasas. The bathroom flooring is Italian tile with metallic flecking, and an inlaid tile carpet. The stainless steel partitions, the well-coordinated lighting fixtures, and the glass sink bowls offer a contemporary clean feel to the space while removing the typical institutional feel of building restrooms. This renovation is allowing Pepperdine to pursue academic expansion on the Malibu campus and to introduce a contemporary working style into our operational departments. 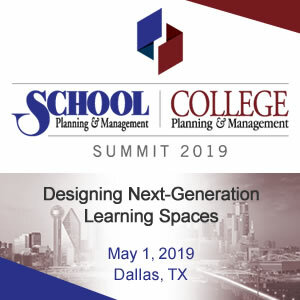 As we, like many higher education institutions, focus on space utilization, we look to the standard set in this project to encourage space use efficiency and workplace collaboration. It has raised the bar to a higher level of design sophistication. Our designed spaces are a reflection of who we are as a university and the mission we endeavor to carry out. We honor a grounded existence, where creativity and diversity are celebrated within the framework of Christian living. We acknowledge absolutes and free will, strength and flexibility, modernity and timelessness, foundations and innovation, and we harmonize their inherent differences. We sought to retain that character in our design here as well…because it embodies Pepperdine perfectly. I like the energy-management system put into place. Forward-thinking technology-enhanced conferencing spaces.